In my office I have a display case. It’s big, bulky and in the way. I bought it with the intention of fixing it up so we could use it for our youth ministry… that was over a year ago! I see it everyday. It started off as being annoying, but it’s honestly more depressing than anything at this point. It was one of those projects that got started, but never finished. I’ve looked at it so many times and thought, “I really need to finish that.” The problem is that I haven’t done it. Unfortunately, I believe that we start way too many things in life without finishing them. We promise to keep a student accountable, only to forget about it a month later. We make promises we don’t keep. We make plans, but don’t follow through. This is life. It’s not that we don’t intend to, or even want to, but as time elapses, it becomes increasingly difficult. I have told people on numerous occassions that while we may judge ourselves on our intentions (that’s why we cut ourselves so much slack), others judge us on our actions. I don’t know what you need to do, but let me encourage you to do thing you don’t want to do, the thing you’ve been putting off for far too long. Make a call, plan a meeting with someone, follow through and execute. 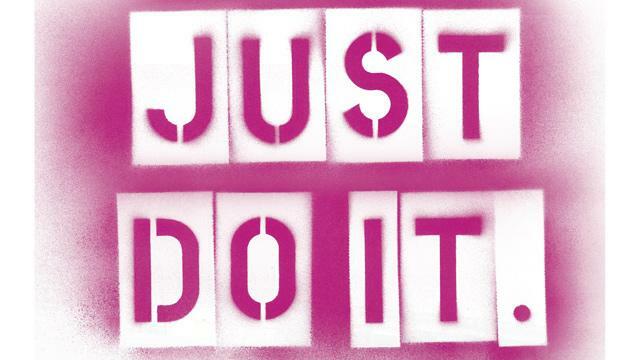 In other words, just do it! Not only will others be blessed, but you’ll find that it might just give you enough momentum to take care of some other important areas in your life.